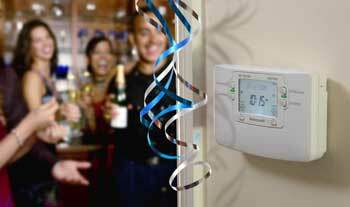 Blog Home > Central Heating and Boilers > Be energy Smart this season – push the ‘party’ button! Be energy Smart this season – push the ‘party’ button! The party season is here! So as a last minute check and to avoid a hefty energy bill in the New Year, Honeywell is encouraging homeowners to push the ‘Party’ button on their thermostats! The Party button manages the heating for you at a low level when entertaining in the home – heat can be lost due to doors left being open and guests stepping outside for a cigarette break, or the heating simply being left on unnecessarily for prolonged periods of time. Pushing the party button avoids over consumption and reduces a homeowner’s heating bills, which as exactly why Honeywell developed the function. To find out more about Honeywell’s wireless heating and zone heating control systems project click here.